over two CAT5e/ Cat6 cables. Transmission range up to 100 meters. Supports high resolution up to 1080p. 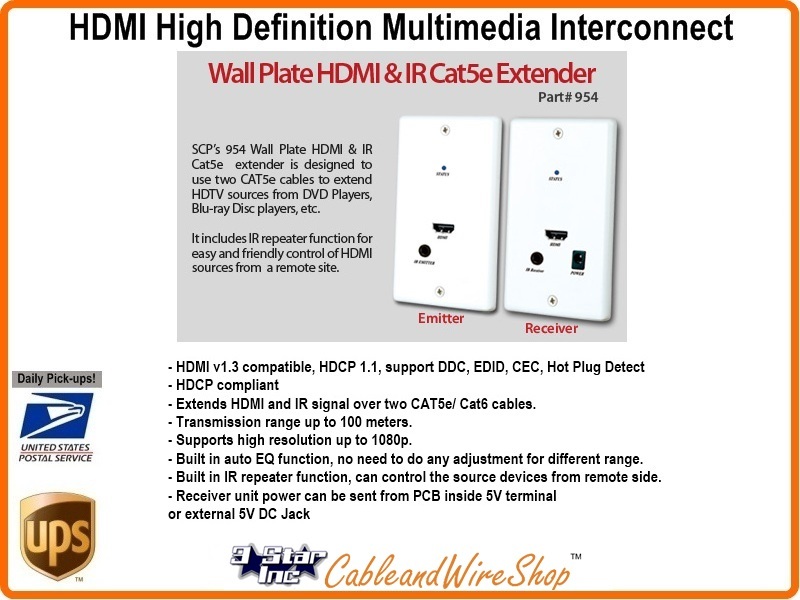 HDMI Wall Plate HDMI & IR Cat5e extender is designed to use two low cost Cat5e cable to extend HDTV sources from DVD players, Blu-ray Disc player PS3. With extra IR repeater function for easy and friendly control HDMI sources from the remote site. This enables easy HDMI installation over a long distance (up to 180ft/60m). Extends HDMI and IR signal over two Cat5e/ Cat6 cables. HDMI 1.3b compatible, HDCP 1.1, support DDC, EDID, CEC, Hot Plug Detect. Note: Cat6 cable is still limited to a maximum of 328 ft (100 m) in length that should include the length of patch cables that interconnect equipment. Cat6 cable performance characteristics and test methods are defined in TIA/EIA-568-B.2-2001. Cat6 solid conductors are for distribution (typically) whereas Stranded conductors are usually reserved for flexible needs such as patch cords and cables. AWG conductor sizing is typically 23, comes in pairs of 4, and UTP (Unshielded Twisted Pair). When using LAN (Local Area Network) cable such as this is used in areas of likely ambient interference that would slow performance from the 550 MHz bandwidth and degrade 1000 Mbps (1000BASE-TX) potential performance, then SHIELDED Cable is recommended and you would then look for the STP moniker that indicates Shilded Twisted Pair. If the cable is run near or in Air handling spaces, then you should check the local building codes pertaining to Plenum cable use as each jurisdiction can be different in definition and guidance. Riser rating is something recommended as a minimum for all interior (in wall) use. CM is for exposed runs and CMX is exteriror rating, though not necessarily UV ray resistant to degradation. CMXT and CMXT are discriptor examples that intonate exterior (X) and flooded (F) or Taped (T) for Underground Use (Direct Burial). Cat5e cable is still limited to a maximum of 328 ft (100 m) in length that should include the length of patch cables that interconnect equipment. Cat 5e cable performance characteristics and test methods are defined in TIA/EIA-568-B.2-2001. Cat5e solid conductors are for distribution (typically) whereas Stranded conductors are usually reserved for flexible needs such as patch cords and cables. AWG conductor sizing is typically 24, comes in pairs of 4, and UTP (Unshielded Twisted Pair). When using LAN (Local Area Network) cable such as this is used in areas of likely ambient interference that would slow performance from the 350 MHz bandwidth and degrade 100 Mbps (100BASE-TX) potential performance, then SHIELDED Cable is recommended. The length of a HDMI cable is fixed and unchangeable after is produced. The HDMI connector can only be soldered or terminated by a professional worker in a factory environment. The user can not reduce or increase the size by themselves if there was need for it... However! Effortlessly extend the reach of your HDMI or DVI (DVI... as in your Computer Video Monitor Cable!) cable link from 165, up to 328 feet between the source and destination HDMI equipment such as digital entertainment centers, HDTV, retail setups, show/convention sites, HDTV, STB, DVD, Projector factories, data center control, information distribution centers, conference room presentations, school and corporate training environments through the use of CAT5e, CAT6 or RG coaxial Cables. The Variety of Extenders showcased in this Category may use one or several cables of the aforementioned variety to extend extend the HDMI signal even farther. These are typically "Plug-n-Play" modules that are Auto-adjusting in compensation for signal strength and cable length.